I tend to subscribe to data when I am in a country where the language may pose a barrier for me. Yes I do speak Cantonese but reading is more of the problem. Maps and street roads would be easier with data and Google maps. How do I get data in Hong Kong? There are some hotels that offer such an arrangement where there is unlimited data and free calls within Hong Kong. Butterfly on Victoria is one of them. The other is Dorsett. They usually provide a smartphone which you can tether your phones to. The other method would be to purchases data packages. You can buy one right at the airport on the arrival halls. Once you pass immigration and customs, before heading to the trains, spot a shop 1O1O on the 5/F of the Hong Kong International Airport Arrival Hall. When I was there, they only had the 8 day package so I opted for it. They did not have the 5 day package. The staff will assist you in setting up your phone and you are good to go. Data was very fast and I did not make much phone calls but it did work. 1.5GB/5GB of data at 4G fast speeds for online action, perfect for those Instagram uploads. You can easily subscribe for roaming data services in Mainland China, Macau or Taiwan for just $40 a day/40MB data. These SIM cards are rechargeable, so you can keep the same number for up to 180 days, making longer stays more convenient. Log on at more than 15,000 hotspots around the city so you can update on the move. See how to find your nearest location here. 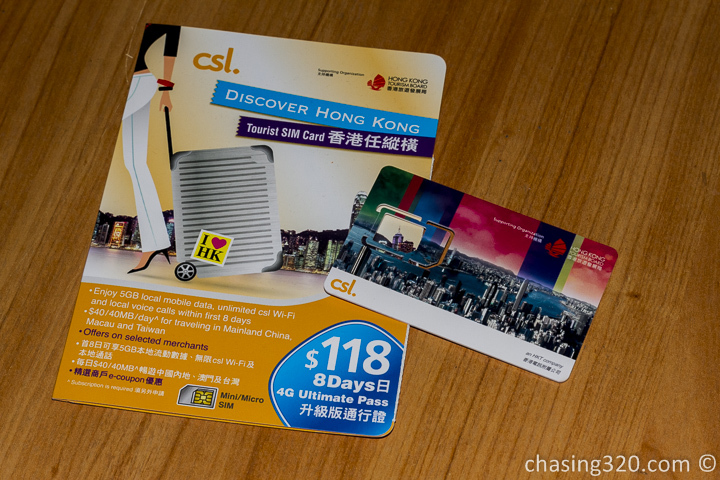 Pre-loaded with HK$30/HK$48 to text updates of your adventures back to home! Also use it for low-cost international calls to 36 countries (a bargain at $0.45/min).